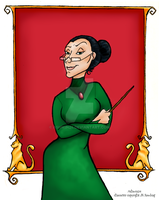 Yes, this is Minerva McGonagall, or, as most people recognize her, Professor McGonagall, the teacher for Gryffindore. I drew her in her cat form because I thought it was cute in the first book where Mr. Dursley was going to work, and saw a cat reading the newspaper. The cat was Minerva McGonagall. I was reading Greek Mythology, and found out that Minerva was part of Athena's Roman name. Athena was the Greek Goddess of wisdom, so that helped me gain a bit of respect for McGonagall. Because of the first book, I kind of imagined her and Dumbledore together, I don't know why. I was kind of pairing frantic in fifth grade. When I found out he's gay, that shattered the picture. This is part of my Harry Potter Project, where I'm trying to draw every single character from Harry Potter. If you want to see my collection (which is getting too long to keep updating with new work) go to my profile and gallery under "Harry Potter Project"
I found this WONDERFUL rendition of McKitty by a rec at sibyllevance's LJ. I adore it and will add it to my own rec site on delicious. Minerva is Goddess of Wisdom and War so I was a bit disappointed that they didn't do more with her in the series. haha! I love it! She looks like Tom,off of Tom and Jerry! I had the same idea about that paring too. Very cool picture!! I really like the look in the eyes!